I’ve always had a hard time liking baseball. Try as I have, I guess it’s just too slow moving for me. Interestingly though, some of my favorite movies are about baseball, “Field of Dreams”, “The Natural”, and “Bull Durham” are movies I can watch again and again. I also enjoy shooting baseball, you have the time to plan for particular shots, depending on the game action and what you think might happen next. While in Missoula a few weeks ago I had the opportunity to shoot a Missoula Ospreys minor league game. It was an assignment for a workshop I was attending and there was a catch, I could not shoot the game but had to look for “moments”. With that assignment in mind I began to formulate a shot list of photos I would like to find and take even before arriving at the game. 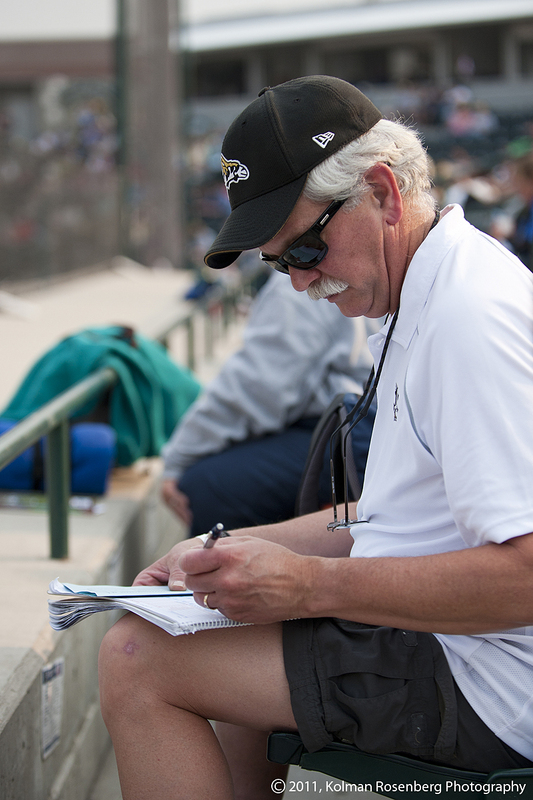 I’ve always noticed and admired the devoted fans I see at baseball games who keep score. They record every pitch, hit, out, etc. They are usually at every game and often are older gentlemen. I decided to see if I could find one of these guys and photograph him in the moment of recording. It didn’t take too long to find one. He was sitting right behind the dugout. A real fan keeps score at the Missoula Ospreys minor league game. I wish I could get into the game as deeply as these real fans do, but until I can no longer hold up a camera, I think I’ll just continue to shoot the action and the moments. This entry was posted in Uncategorized and tagged baseball, Diamond, Dugout, Fan, Field, Game, Minor League, missoula, montana, Osprey, Scorekeeper. Bookmark the permalink. Fond memories. During the 40s, my Singing Aunt & I listened to the radio & scored the Indians’ games. That would make you a “real fan” Carole! I had an aunt who scored games also. She and my uncle would take me to Phillies games and she was just a fountain of interesting information about the players on both teams.